The Bemidji State women’s hockey team will try and spoil Ohio State’s senior weekend with an attempt of a season sweep of the Buckeyes Friday and Saturday in Columbus. Meanwhile, No. 9 Ohio State (17-11, 11-9 WCHA) will strive to send its seniors out with a win and protect home ice for the last time in the 2018-19 regular season against Bemidji State (10-16-2, 7-9-2 WCHA), which has gone 10-7-1 since gaining its first two wins against the Buckeyes on Nov. 9-10. 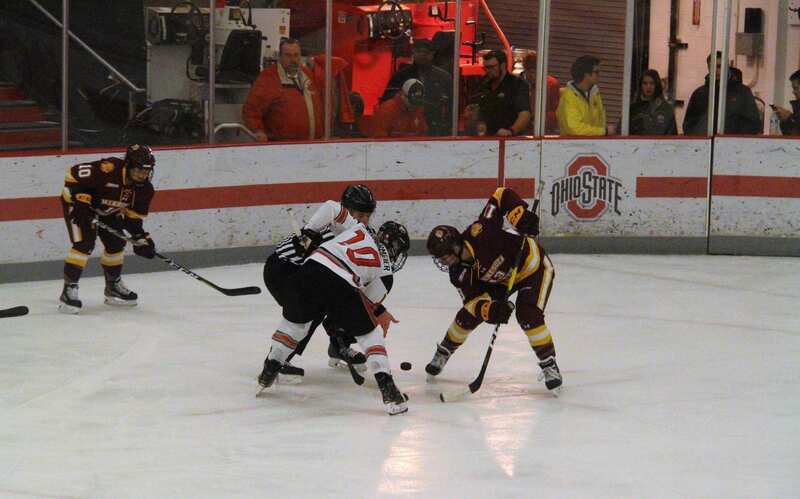 “Their goaltending has stepped it up big time,” Ohio State head coach Nadine Muzerall said. Bemidji State redshirt sophomore goalie Lauren Bench might have the second lowest save percentage in the WCHA at .914, but her 29 saves against No. 1 Wisconsin on Feb. 1 allowed the Beavers to prevail in a 2-1 upset win. The Buckeyes know the feeling all too well, for they came into Bemidji, Minnesota, ranked No. 4 before dropping their November road series against Bemidji State, which entered the series winless in its first 10 games. Six different Beavers scored against Ohio State in the series, with strikes coming from each of Bemidji State’s top three goal-scorers: sophomore forwards Clair DeGeorge and Paige Beebe and junior forward Jacqueline Kaasa. Ohio State senior forward Erin Langermeier said the Beavers will not be facing the same Buckeye team that took those 2-1 and 4-2 losses. The Buckeyes are coming off a road sweep of St. Cloud State that saw 4-0 and 5-0 Ohio State victories to stop its five-game losing streak. Muzerall said the wins were imperative for getting the Buckeyes back in position to make a late postseason run, for they currently sit outside the top eight NCAA tournament qualifying slots. Ohio State senior forward Madison Field said the wins allowed freshman goalie Andrea Braendli to get back in rhythm after the Swiss Olympian had taken the bench amid tumultuous goaltender play during the Buckeyes’ skid. Not only did the shutouts and 50 combined saves win Braendli renewed confidence, they also earned her NCAA No. 2 Star of the Week and WCHA Rookie of the Week honors. Bemidji State sophomore defenseman Tina Kampa won an award of her own this week when she was named WCHA Defenseman of the Week after blocking 13 shots in the win against Wisconsin. Kampa is third in the WCHA with 62 blocks this season. Despite Bemidji State’s 2-9-2 season road record, Muzerall said her players need to believe the Beavers are a team to contend with, or else they will face a second sweep to the second-lowest scoring team in the league. Ohio State’s senior weekend series against the Beavers begins at 6:07 p.m. on Friday at the Ohio State Ice Rink and will continue at 3:07 p.m. on Saturday.